We look forward to welcoming you for a relaxing stopover. Enjoy our lounge and try our cassoulet. After a peaceful night's sleep and a healthy breakfast, you're sure to get the next day off to a good start! 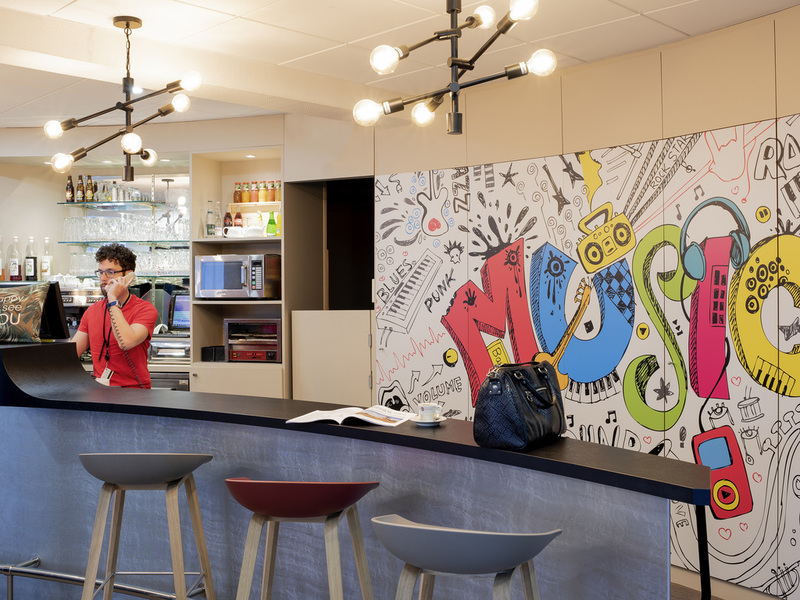 The newly renovated 3-star ibis Toulouse Université hotel, in the south-west of Toulouse, is 10 min from Capitole in the city center, Toulouse Blagnac airport, the Zenith, the convention center, exhibition center, Barrière casino, the stadium, Oncopole cancer research center and the Pierre Fabre Laboratory. Close to the A64 highway and metro, the hotel is just 15 min from the Cité de l'Espace and Airbus sites. Restaurant open Monday through Saturday 7pm to 10:30pm. Free enclosed car park. 5 min from the future Canceropôle (cancer research center). 10 min from Exhibition Center and Toulouse Stadium. Close to Casino Théâtre Barrière and La Cépière racecourse. The staff is very friendly. Just a bit confusing to find the hotel entrance as pedestrians must use the same gate for cars. I stayed for two nights, and found the hotel satisfactory, but it was a bit too noisy for my liking, the sound insulation from adjacent rooms was not adequate and I had a hard time finding quiet in the room. It was clean, but the bed asn't the most comfortable I have slept in. Good value rooms but food overpriced. We were very happy with the room but I feel the food was overpriced. We arrived very late at night so picked from the 24 hour menu but was a bit surprised we were basically paying for a frozen microwave meal. The food was nice but for the portion size and fact it was taken from a freezer behind the reception desk and reheated it was very expensive. Other than this everything was fine. All very satisfactory Restaurant was enjoyable. I only stayed for one night, but it was the best nights sleep i had in two and a half weeks. Lovely staff, extremely helpful and patient, very clean facilities, all adds to the comfort. I left refreshed and revitalized, allowing the long drive home through some absolutely stunning scenery to be appreciated to it's fullest. A comfortable stay in a very convenient hotel. We found staff very welcoming and helpful. The room was clean, comfortable and well equipped. We enjoyed a good breakfast, which was a good preparation for our onward journey. The price for our stay was very reasonable, particularly as our package included breakfast. I needed to stay in a location convenient for work. this location was only 3 km from Oncopole. our stay was during the interior renovation, so some of the areas were not accessible. by comparison to other hotels the rooms are smaller, but this is common to the price paid. Everyone at the front desk services spoke English and helped answer any question we needed, the breakfast was fresh and complete. The hotel was comfortable and clean. The room was small but big enough for two people. Bathroom was good but Ii had bath tub instead of shower tray (which I prefer). Staff was friendly and helpful. The breakfast buffer was very good and it had soy milk which is great. Our 4th visit this year and refreshing that it is still as welcoming as befour. The staff were excellent. The beds were very comfortable. The room was nice and clean. The room was freezing, the heating didn't work and the air vent in the wall let in the freezing cold wind. pleasant. hotel getting a little tired but fine really.